Tomorrow is ANZAC day, a day when we commemorate the services and sacrifices of members of the Australian and New Zealand armed forces. This year is a particularly important day as the centenary of the landing of the Anzacs on the Gallipoli Penninsula. We observe a number of traditions on the 25th, the most important being the dawn services held across the country. A large number of Australians also enjoy visiting their local to play a game or five of Two Up. 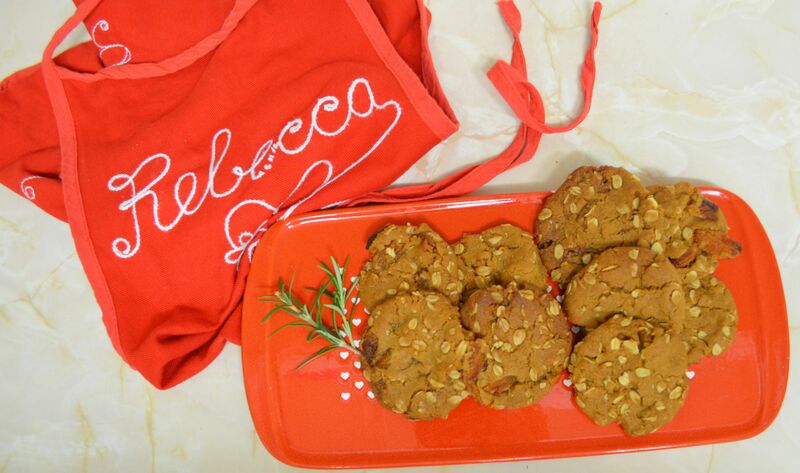 Anzac biscuits are a staple in any Australian biscuit jar year round, but really have their time in the spotlight near the day- so much so that I had to visit three supermarkets to track down my golden syrup! 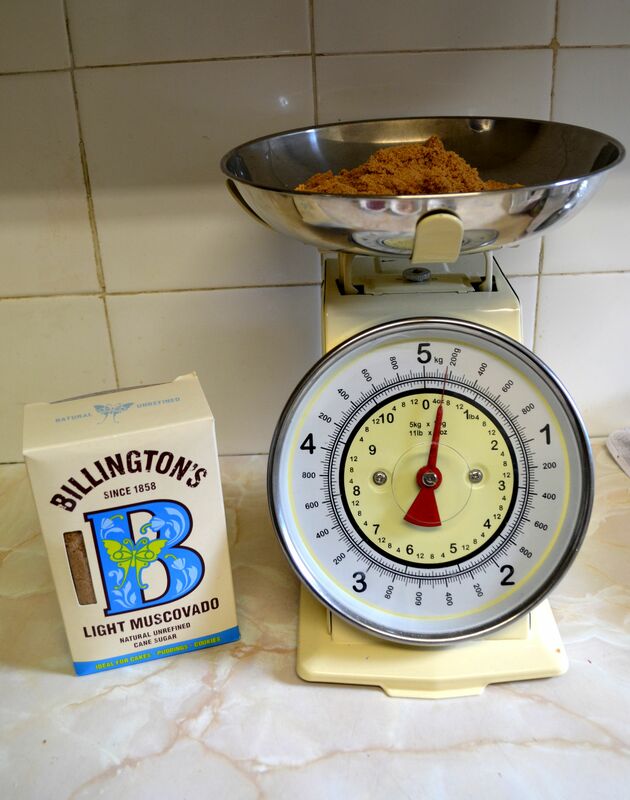 I figure that everyone has their own recipe for Anzac biscuits, passed down from Grandmas and Aunties, but I thought I would do a short post including my own variation. This one is super easy as it is all done in one saucepan- I like any recipe that minimizes my washing up! I like to add some chopped Turkish dried apricots to my mixture for some extra sweetness and chewiness – everyone at work who tried them seemed to enjoy the addition. Plus, the link to our Turkish friends is a nice touch. 2. Stir buter, syrup and water in a saucepan over medium heat until the butter is melted. 3. Remove from the heat and stir through bi carb soda (I love this part). 4. Add the rest of the ingredients and stir until completely combined. 5. 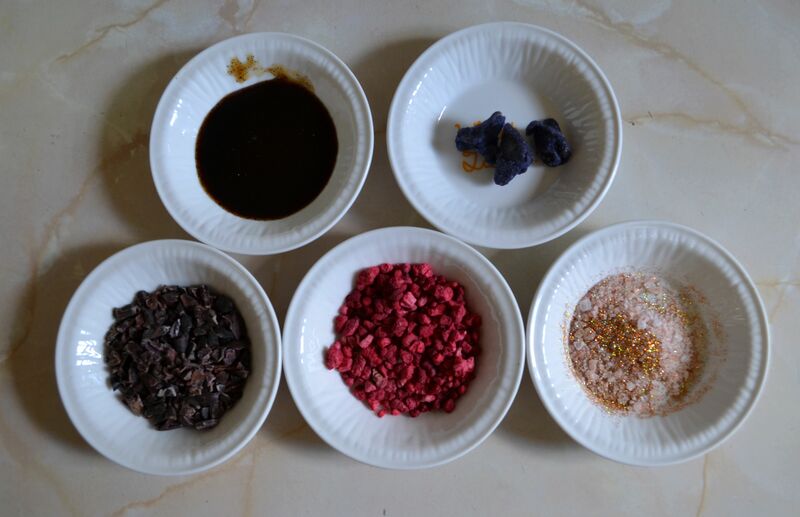 Roll heaped teaspoons of the mixture between your palms and place on the prepared trays, 2cm apart. Flatten slightly with a floured fork. 6. Bake for 15-20 minutes (depending on how chewy you like them) and cool on trays. 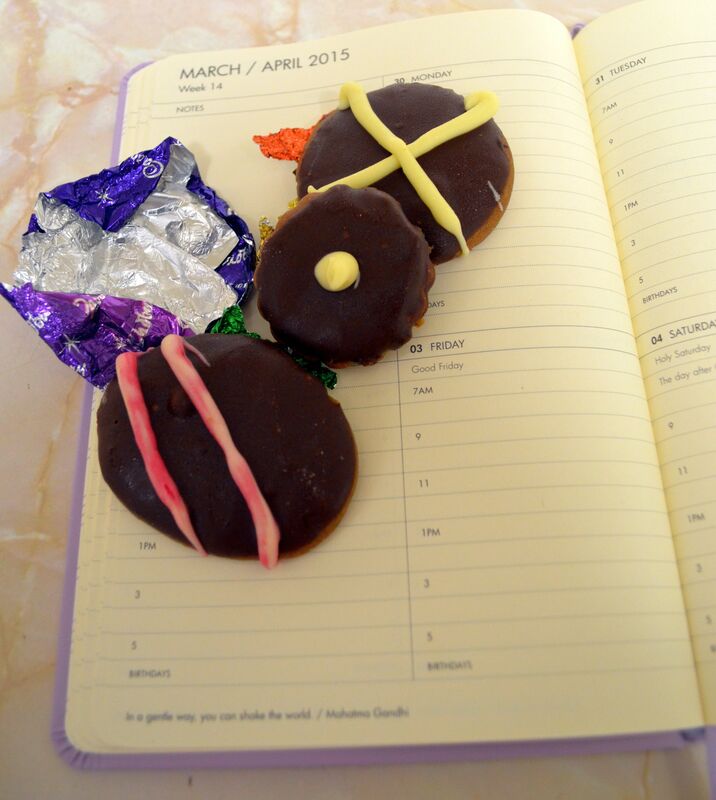 I’m still working on the promised passion fruit recipe- but keep an eye out for some more delicious sweets soon. Yep! 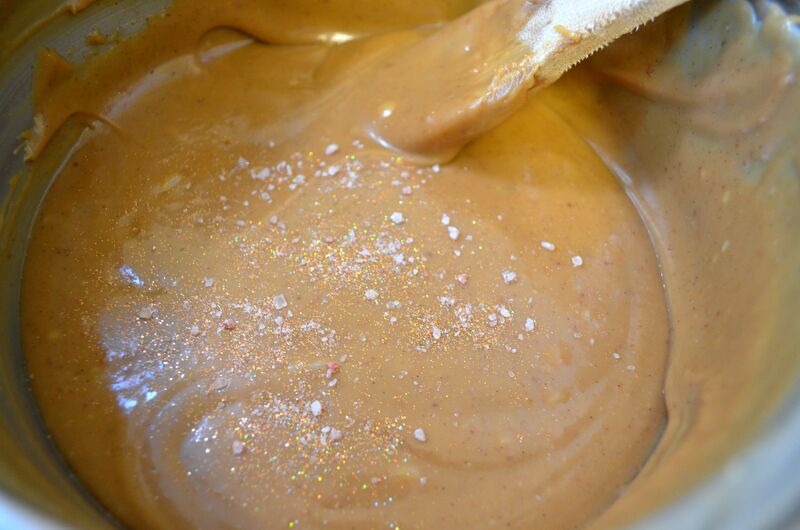 It’s salted caramel again. This yummy fudge is really simple to make and great as a homemade gift, or as a sweet addition to your next gathering. 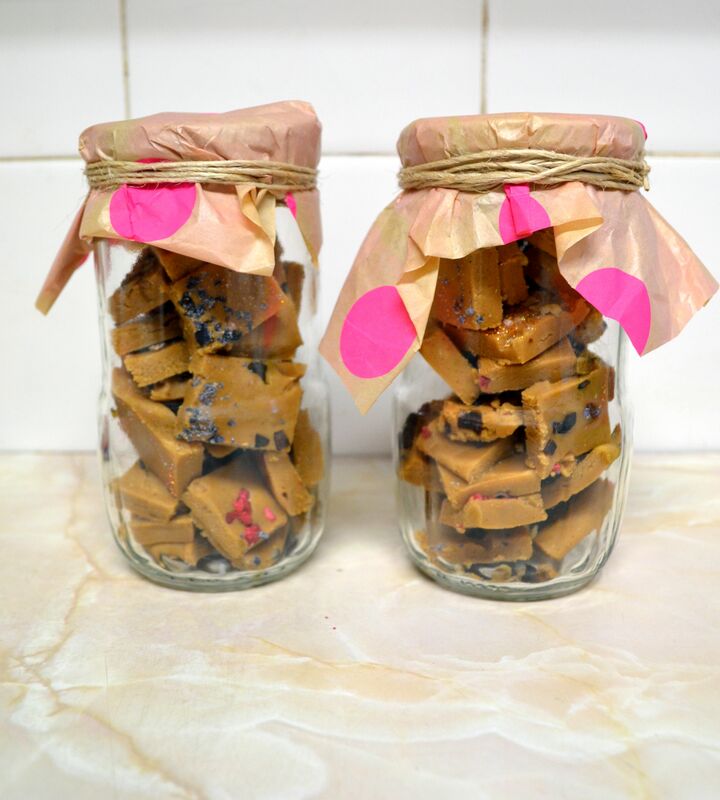 I made two batches this week, one as a part of a housewarming present for some work friends and another split between two of my good friends for their birthdays. It was very well received in all cases and had some excellent reviews! 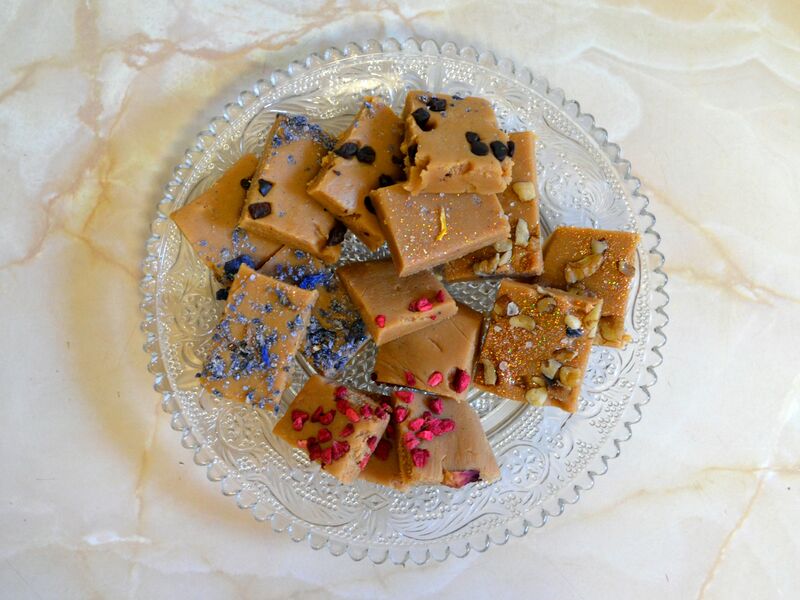 The fudge itself has very few ingredients- sweetened condensed milk, butter, muscovado sugar, vanilla and sea salt. I like to decorate it and add to the flavour with a few different toppings- I’ll suggest a few below, but definitely feel free to leave it plain or sprinkle with some extra salt flakes. 1. Place the sweetened condensed milk, sugar, vanilla and butter in a large (preferrably non stick) pan. 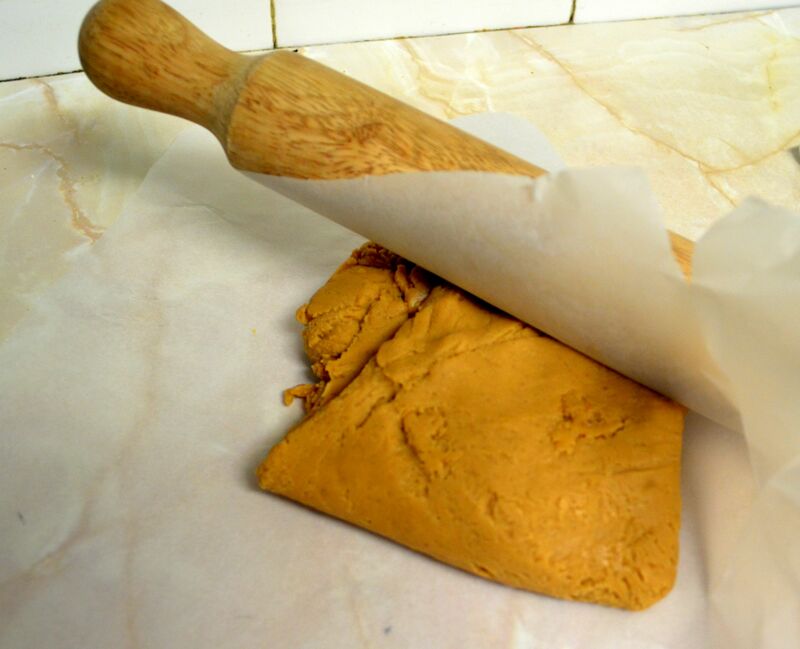 Fill a glass with iced water to use to test the fudge and place a large piece of baking paper on the bench. 2. Stir mixture with a wooden spoon over medium heat until the butter is melted and the sugar is dissolved. 3. Slowly bring the mixture to a rolling boil, stirring constantly for around ten minutes. Turn off the heat and allow to cool for five minutes. 4. Add half of the sea salt (and some glitter if you’d like to) to the cooled mixture and begin stirring again. I place my pan on a teatowel on the bench so that it doesn’t move around, as the mixture becomes quite stiff. Stir as briskly as you can for around eight to ten minutes- you’ll notice the texture change and thicken as you go. 5. Drop a small piece of fudge into the glass of water- you want it to drop to the bottom of the glass and make a soft ball or teardrop shape. 6. Spoon the thickened mixture onto the prepared baking paper and spread out with the back of a metal spoon. Even it out with a rolling pin until you have a nice rectangle of around 1cm thickness. 7. Press your chosen toppings into the fudge slightly and leave to cool completely. 8. Cut the cooled fudge into squares. Store in an airtight container or jar. told you it was easy! I hope you’ll give it a try at home. I’d love to hear about your cooking and baking inventions if you’d like to leave me a comment below. 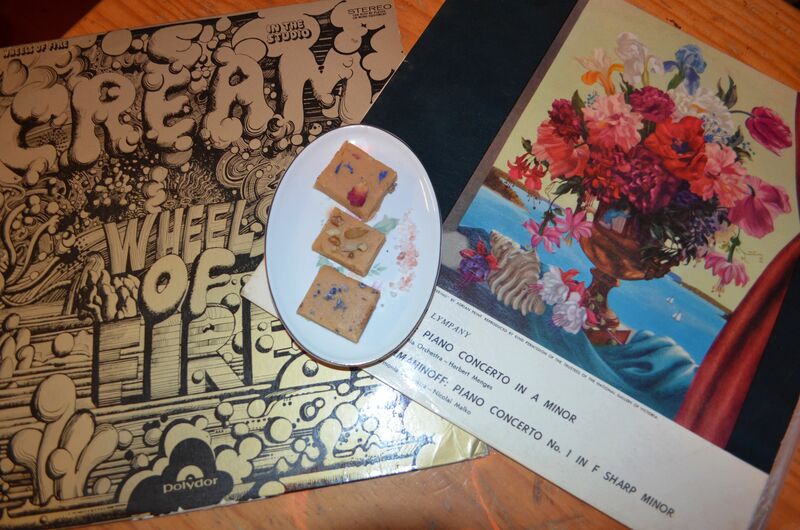 Two of the albums I listened to while I was making the first batch of fudge. 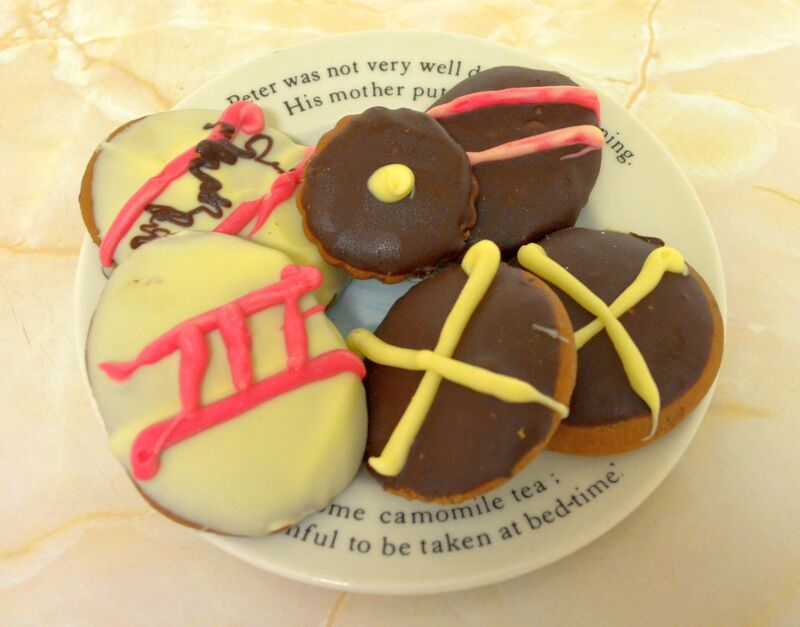 These tasty biscuits are nice and soft and flavoured with spices reminiscent of hot cross buns and a bit of cocoa. 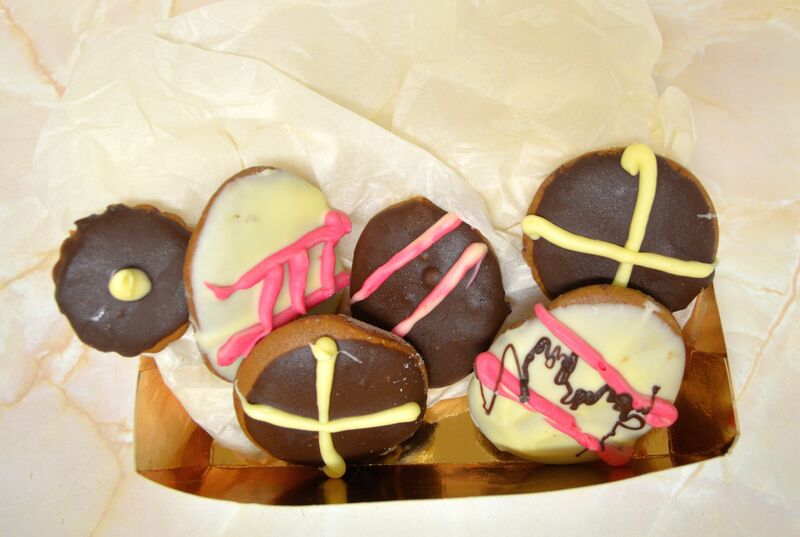 I dipped them in melted chocolate and piped on contrasting decorations to make easter egg and hot cross bun desgins. I think they look pretty cute for the short amount of time I spent decorating them. They were a big hit at work and I plan to make another batch before the weekend is out! Please forgive the lack of methd photos and the not so great photos of the finished product – I made these quite late on a work night. My soundtrack for this recipe was equal parts Disney, Eric Clapton and The Rolling Stones- I’ve been reading an interesting biography about the Stones and thus they have been on high rotation! 1. Combine the butter, dark brown sugar and golden syrup in a small saucepan and stir over medium heat until smooth. 2. Add hot mixture to a large bowl and cool for 10 minutes. Add egg to cooled mixture and stir until combined. 3. Add half of the sifted dry ingredients and stir until combined, and repeat. 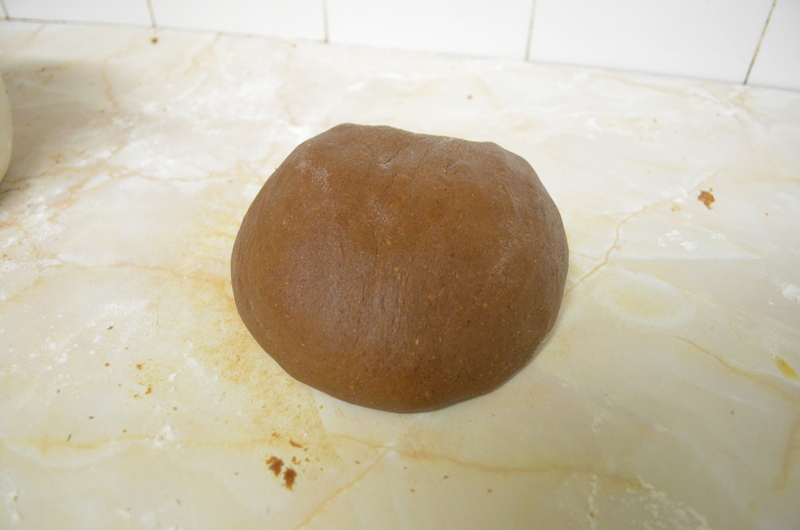 Taste dough and add more cocoa or spice if desired. 4. Turn your dough out onto a lightly floured surface and knead, with floured hands, until it loses its stickiness (about 5 minutes). 5. Wrap dough in cling-wrap and refrigerate for 30 minutes. 6. Preheat oven to 180°C and grease & flour two oven trays. 7. Remove chilled dough from the fridge and roll out to about 0.5cm thickness and cut out your shapes, with a lightly floured biscuit cutter and placing onto trays. To get my easter egg shape, I cut out circles and then used my fingers to make them longer and more egg-like. 8. Bake for around 15 minutes, keeping an eye on them and turning or swapping shelves if necessary, and remove when just golden brown and fragrant. Cool on trays for 5-10 minutes and then place on wire racks to cool completely. 9. Place chocolate in wide, shallow glass or stoneware bowls. Heat in bursts of 30 seconds at medium heat in microwave, stirring at each interval until melted. Add a tablespoon of oil to each and stir to combine. 10. Carefully dip the top of each cooled biscuit into one of the melted chocolates and place on a sheet of baking paper to cool. 11. 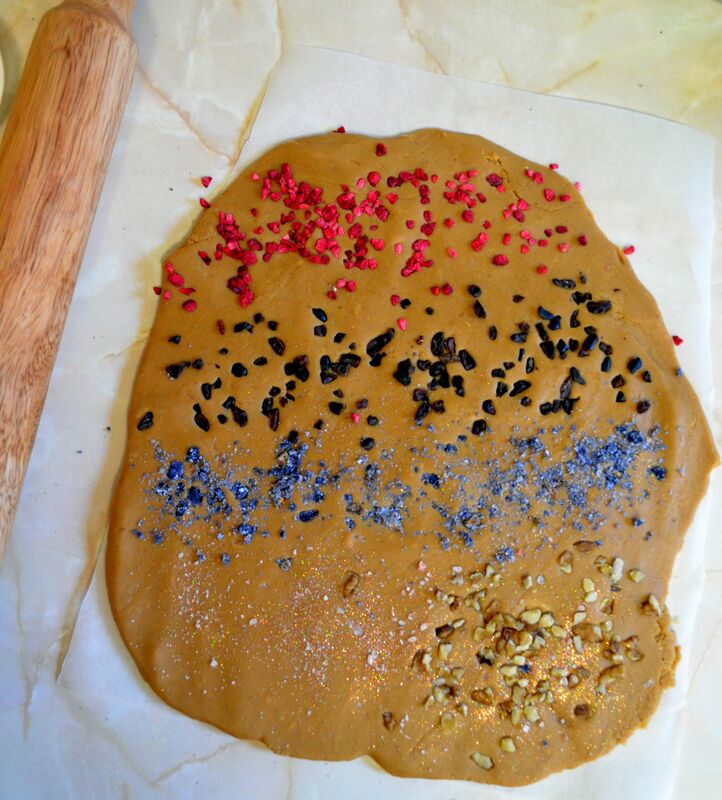 Using a piping bag or a ziplock bag with a corner cut off, pipe contrasting or coloured chocolate onto your dipped biscuit top and dust with shimmer if desired. 12. 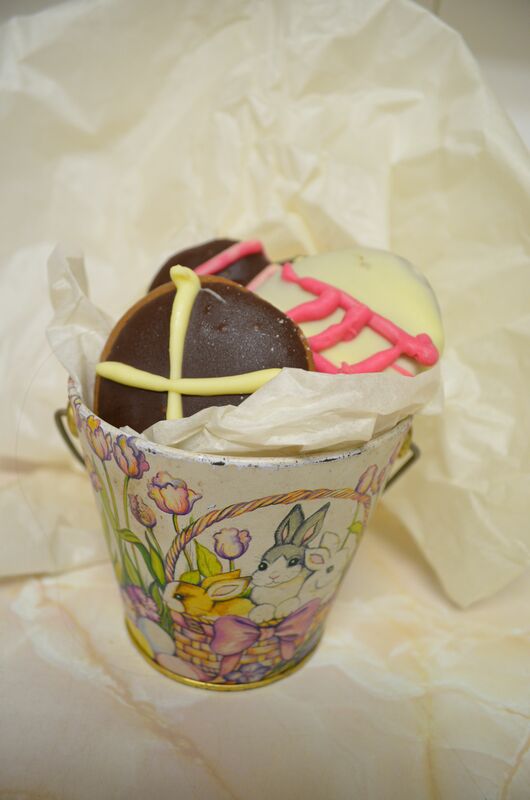 These biscuits are a delicious Easter treat and will keep for at least a week in a container, or in cellophane bags for gifting. p.s. If you like my lovely vintage ironstone bowl, take a look at acreativelifestyle on Etsy, it’s curated by a lady in Tasmania and features a great collection of kitchen and homewares at really great prices.